My life, under the microscope...: Merry Christmas! I can't believe tomorrow is Christmas! I ran out of time to take pictures of the animals wearing the Santa hat this year. I didn't even have time to do a Christmas email, or a Christmas poem. I finished the last project last night, whew! Got up at 5:30am today and between barn-sitting, airport-shuttling, and a meeting I seemed to be gone more than home. I'm absolutely exhausted! However, I'll leave you with a December memory from long ago. 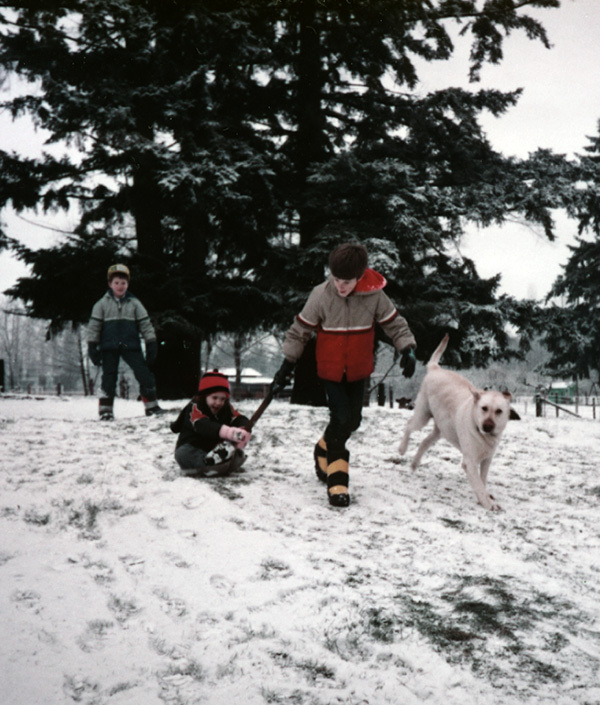 This was the one time I remember it snowing when we lived in Redmond, WA. My brothers and I pulled each other around on big shovels. To this day I remember how fun that was! I have a strong urge to go sledding lately, might need to do a snow adventure this winter!